Earlier today the news site I love to hate, 9news.com posted a story about McCain selecting Palin as his running mate. Just take a look at the copy in the first image then the second. Pretty much any male with a juvenile mind, like myself, should get a good laugh. These images were captured from 9news.com, content within the images and the graphics are copyright of their respectful owners. 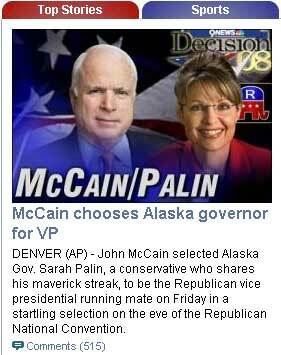 Of course the jokes can range from sexual innuendo or related to Palin’s acceptance of oil exploration. Previous Previous post: Hug your children, your nieces and nephews.